Relativity DevHelp Community is a forum for discussing all aspects of Relativity development and posting questions and solutions. We welcome all types of users, but the forum is specifically geared towards those who develop on the Relativity platform. Our goal is create a knowledge base that can be shared and supported by all. In order to grow this forum and build a stronger Relativity developer community, we encourage your participation. If you have any questions or comments, contact us at devhelp@relativity.com. Visit our Relativity Community Portal to create a new account. Fill out the required fields and click Sign Up. After you fill out the form, your receive an email with instructions for setting your password. Open the password change link, set the password, and log into the Relativity Community portal. In the navigation bar located at the top of the page, click Groups. In the list of Groups, click on the Relativity Developer Group. Click the + JOIN GROUP button in the header and click on it to join the group. You are added to the Relativity Developer Group. We encourage you to subscribe to this Group as Relativity will be using this section to post developer-specific information. 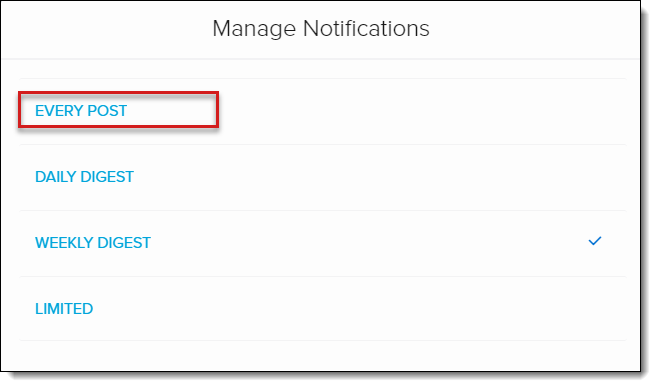 On the Manage Notifications dialog, select the frequency. We recommend subscribing to EVERY POST to receive notifications of all activity in the group. 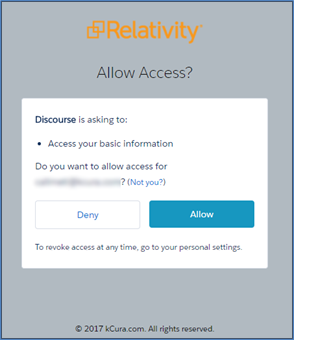 Note: All Relativity DevHelp Community users are required to have a Relativity Community Portal account to access the Relativity DevHelp Community. 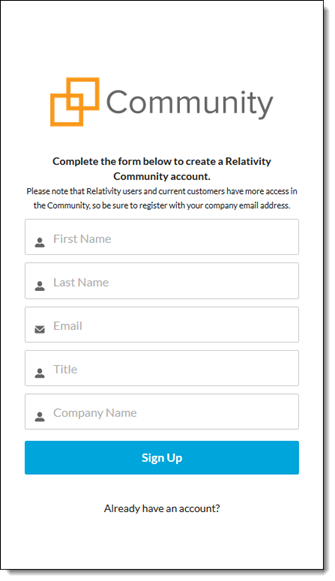 Visit https://devhelp.relativity.com/login to create a new Relativity DevHelp Community account. Click the Sign Up button on the Create New Account. Fill out the necessary information and click Create New Account when you are ready to submit your request. Note: Use the same email address that is used by your Relativity Community Portal account. 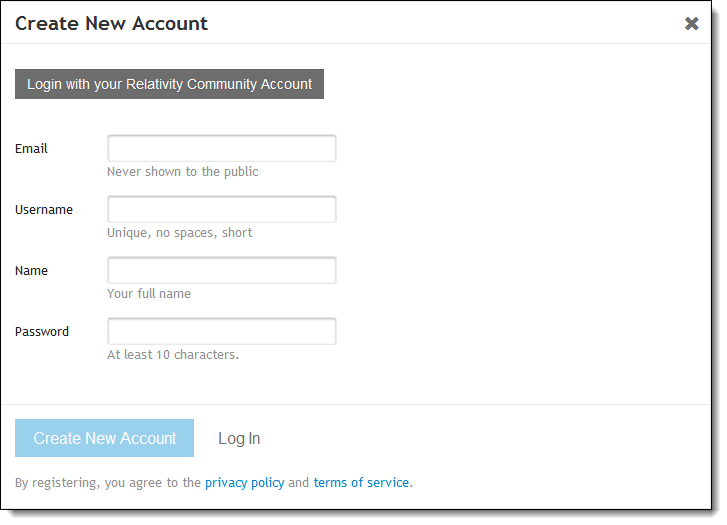 Once your account is approved, you can start using the Relativity DevHelp Community. Note: Allow at least 1-2 business days for the approval of your new Relativity DevHelp Community user account. Open https://devhelp.relativity.com and click Log In. Click the Login with your Relativity Community Account button. You are redirected to the Relativity Community Portal login page. Provide your Community credentials and click Log In. If your Relativity Community and DevHelp accounts are approved and active, you see the following window. To enable this method of login, click Allow. You are automatically redirected back to the Relativity DevHelp Community after successfully logging in. Enter your Relativity DevHelp account credentials and click Log In. 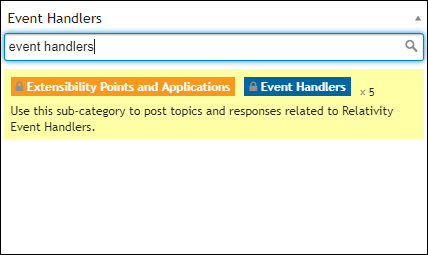 To post a topic or a question in the Relativity DevHelp Community, click New Topic. Provide a Topic Subject, Question and select an appropriate Category. Enter the text and click Create Topic. Note: A category is not required when creating a topic, but we highly recommend assigning one so the topic can find the proper audience. To reply to a topic, click Reply. To edit a topic, click the pencil icon. Enter the new information and click Save Edit. Note: Currently you can edit only the topics you created. You do not have the permissions to edit the topics created by other community members. At Relativity, we strive for the highest standards of professionalism and public conduct. Our developer community is a welcoming and friendly environment that promotes sharing knowledge and productive discussions. When posting, be respectful, considerate, and keep the conversation relevant to the topic. For general community guidelines, see https://devhelp.relativity.com/faq.